nautsbuilder "v1" original maker here, not dead and all. Next year the nautsbuilder.com domain will expire and I will not renew it. If you are interested in using it Blatoy, I can transfer it to you. On Commander Rocket's Laser Trap, replace "range" with "radius" since it makes more sense, especially considering the double laser upgrade which changes it to "range 10" when it's not really that. Dizzy's Greatest Hits uses the wrong image on 'nautsbuilder. 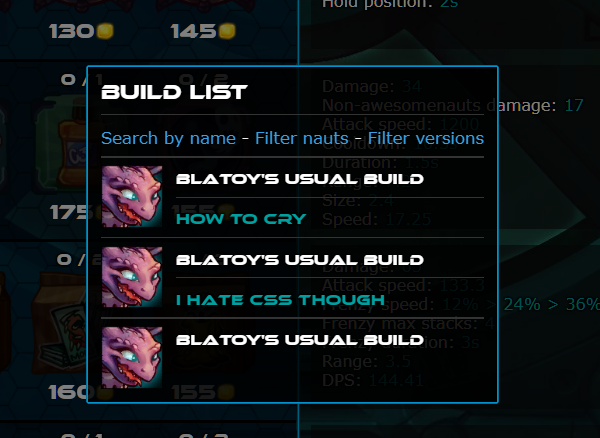 Nautsbuilder has been updated with a lot of features you requested! With this update, everything that was in Nautsbuilder V1 should be in this version too. Also I'm gonna contact Leimi to see if I can have the nautsbuilder.com domain since he said the old one wouldn't be updated anymore. This would be great because all the old link should still be compatible. Please if you find any bugs report them! There was a lot of changes so it's possible you find some bugs. If you want to help, check all upgrades that need to interact with other (I'm looking at you Starstorm Statue) as they will probably have wrong values. Thanks for keeping up with this. Actually you should thank Kida, CraftedNightmares, Kamil, Morrosaw and co who always keep the data up to date, I rarely update things and usually act only when someone reports something.